This was the lovely tofu dish I made for our Chinese lunch party. It is so very good, and incredibly simple to make. As I previously mentioned, it is literally just a block of cold silken tofu, topped with shallots, some different seasonings (soy sauce, sugar, sesame oil, black vinegar), a chopped up century egg and some coriander. They're quite simple ingredients, but they pack a big punch. 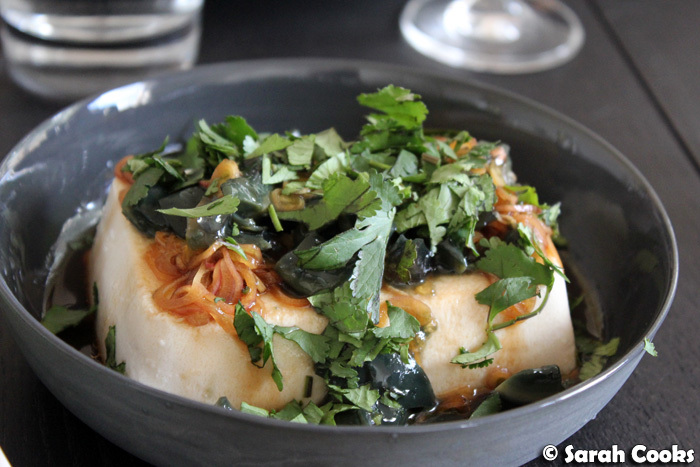 The soft, bland creaminess of the tofu is the perfect foil for the strong flavours. Because there's no cooking involved, and very little prep work, I thought it was an easy way to add another dish to an already crowded menu - no last minute steaming or stir-frying involved with this one! I'd had this dish for the first time at Spice Temple the week before, and I remember being impressed by the creamy texture of the tofu and the intensely flavoured sauce. After we got home, I started researching (i.e. googling) the recipe, and realised it was both very popular for home cooks, and much simpler than it looks - all the complex flavours of the sauce really just come from getting a few different bottled sauces and stirring them together. (Given Neil Perry's reputation I'm almost certain the restaurant sources artisan products, but at home I'm more than happy with store-bought sauces). The next day I went out and picked up two packets of silken tofu, and funnily enough, later that week in the Epicure, there was a Jill Dupleix feature on tofu recipes! 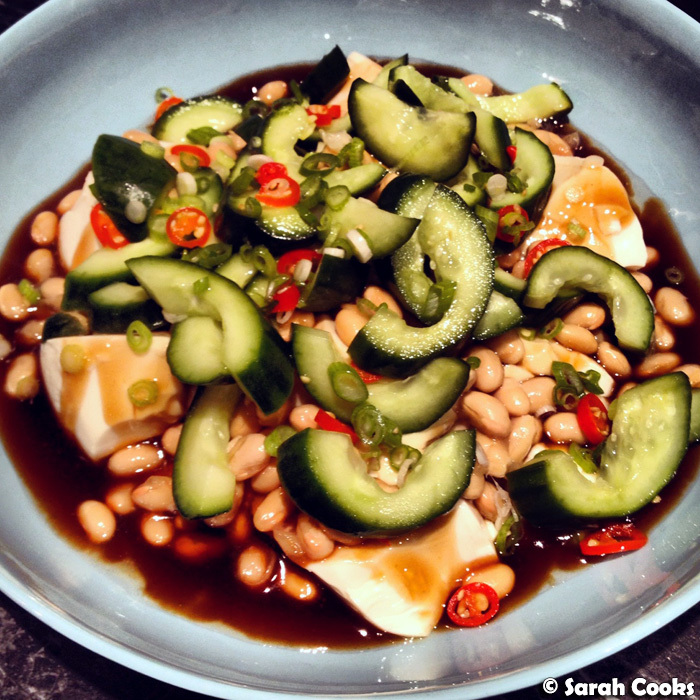 Her "silken tofu with soy beans and chilli" looked especially tempting, and I made it for a mid-week dinner. It was so tasty and healthy, even more so because I had it with brown rice. (Recipe available here). I struggled to get the tofu out in one piece, so I broke it up artfully (heh) with a spoon. Even though Jill Dupleix called it "silken tofu with soy beans and chilli", with its soy sauce, soy beans and soy bean curd, I tend to think of this dish as "Symphony of Soy". 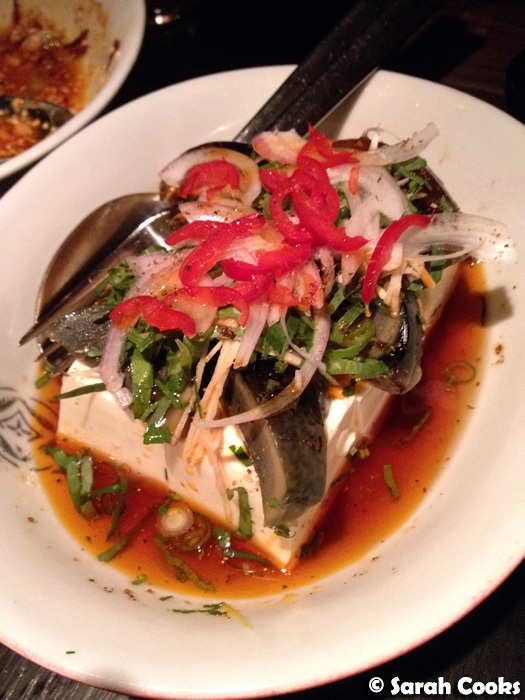 It takes a bit more work than the century egg tofu, as you have to cook the sauce and steam the tofu in this dish. Whilst it was great, I actually like the cold tofu better - it seems to lose its creamy texture when you steam it, and becomes more jelly-like. So, back to the original dish. Here is the tofu - out in one piece, wahoo! My suggestion for getting it out safely is to simply peel back the wrapper and invert it onto a plate, giving it a little shake if necessary. Don't bother trying to use a knife to loosen the tofu from the sides of the packet, as you'll probably just end up cutting the delicate tofu and breaking it up. (Or that's what happens to me, anyway). 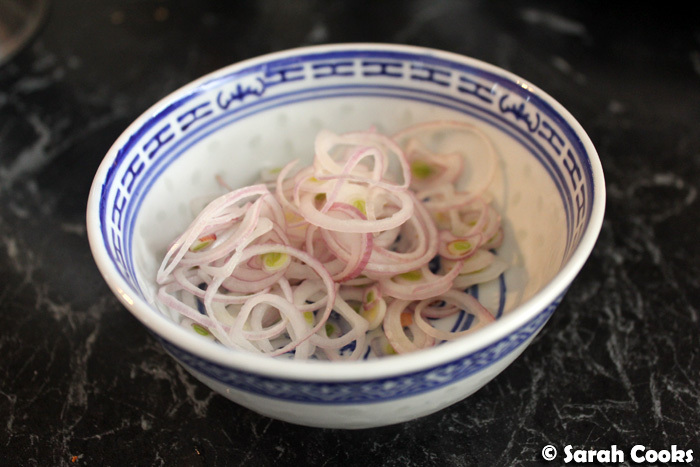 I used a mandoline to finely slice the shallots - as you're eating them raw, you want them cut as fine as you can possibly manage. Having said that though, steeping them in the sauce mixture (see recipe below) does soften them and mellows the acridness. You don't really need to leave it for that long - a few hours is ideal, but just letting them sit while you prepare the rest of your meal will be fine. 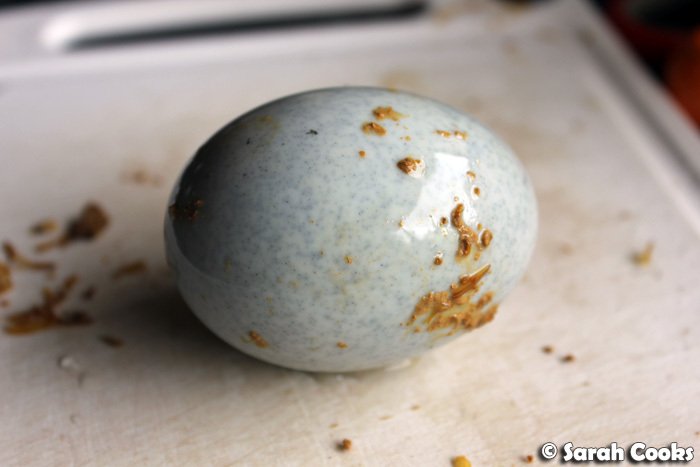 Now we get to the exciting part: the century egg! 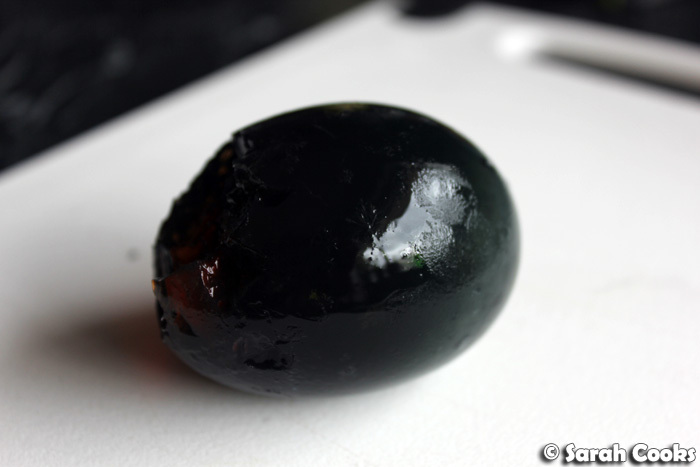 I'd never cooked with century egg before, so I was pretty interested to see what it was like. The one I bought was covered in a hay-like substance. (Not sure if that's still necessary given modern production methods, or if it was just for presentation - you can also buy century eggs without any coating on them). I used my thumb to break off the coating, and rinsed it in water to get rid of as much of the residue as I could. You have to peel it very, very gently - it's much more delicate than a hardboiled egg! You'll see mine broke a little as I was a bit enthusiastic with it - oops. This is what they look like in the middle. I was surprised by how liquid the yolks were - when I've had them at restaurants they tend to be more solid. They tasted right, though! And that's it, really. Just chop up the eggs, and place them on the tofu with the shallots and sauce, finishing with some chopped coriander. It's an easy way to add another dish to your meal, or as a meal in itself with some rice if you don't want to do a lot of cooking. But don't just make it because it's easy - make it because it is very, very good. Peel and very finely slice the shallot (a mandoline will make this easier). Place in a small bowl. Add the sesame oil, vinegar, soy sauce and sugar and stir to combine. Cover with cling wrap and refrigerate while you get on with the rest of your meal (3-4 hours is ideal, but don't worry if you can only give it 20 minutes or so, it will still be good). 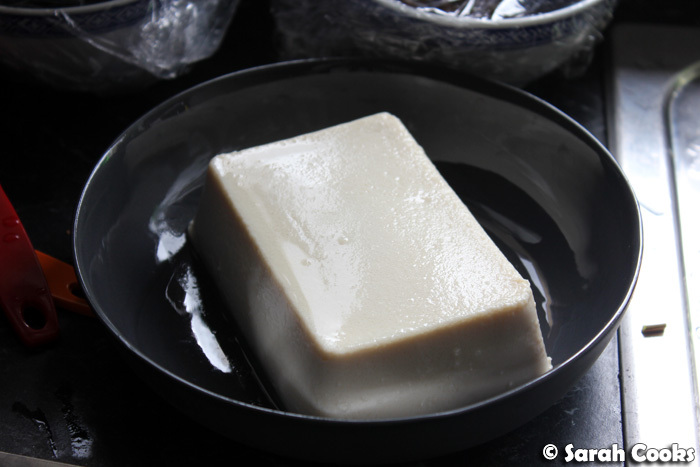 Unwrap the tofu, drain off any excess water and carefully invert onto a serving plate. If you can get it out in one piece - YAY! If it happens to break, then gently break it up with a spoon to make it look pretty. 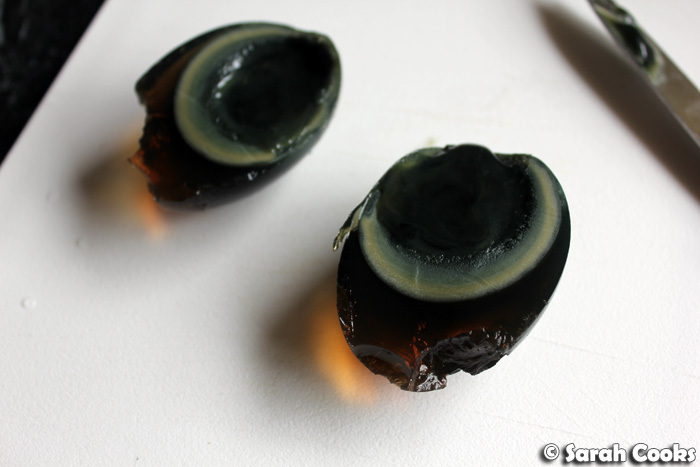 Peel and roughly chop the century egg and scatter it over the tofu. Pour over the sliced shallot with its sauce. Sprinkle with fresh coriander to serve. Oh my heavens, this looks perfect, perfect, perfect. Light fresh vibrant, with tofu and then assertive pungent intense flavours.... so my thing! I made this dish straight after I read this post yesterday. Loved it! Sauce mixture is tangy and sweet, very appetiting. Did tweak the recipe a bit. 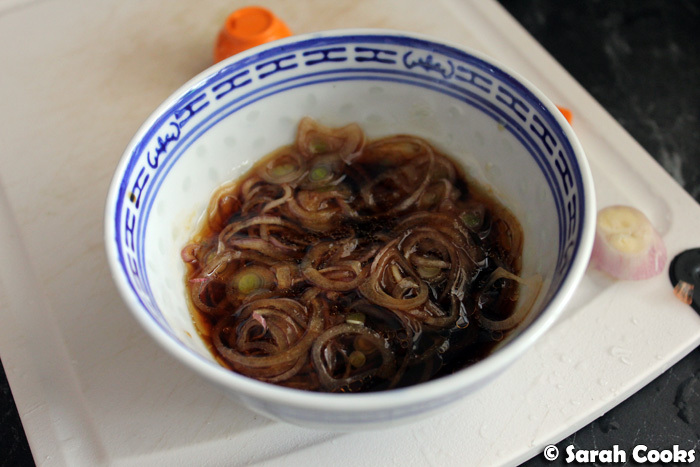 Instead of using freshly sliced shallots, I used fried shallots and added a bit of shallots oil to the sauce mixture. Can see this dish on the table more often especially duing summer. Hannah - Thank-you! I hope you get a chance to make it one day, either during or after your lovely travels! cltyw - Yay! So glad you liked it. 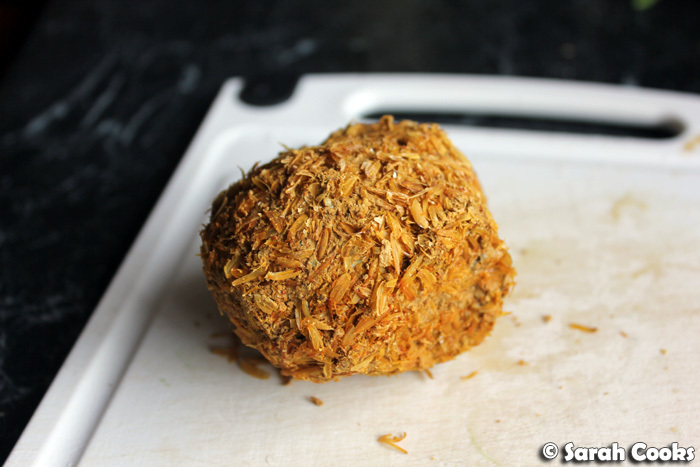 I can imagine the texture of the fried shallots going really well with this! Silken tofu with century egg is such a simple thing yet so amazing and brings back so many memories. This looks delicious! Winston - Aww you're too nice!! :) Thank-you! My my, this looks magnificent! From the tofu down to the century egg. It's incredible! I got mine from a local Chinese grocer.